The rendering work shown above was stopped due to the unstable and unsafe scaffolding. Scaffold was not fixed firmly to the ground. Walk platforms were not fully bordered. The standards were not vertical. There was no guardrails and toe boards. Probable collapse of scaffolding - People at risk: Laborers working on the scaffolding. Fall from height - People at risk: Site workers. Contractor does not have any commitment towards HSE issues. No regular checks or inspection of scaffolding being carried out. 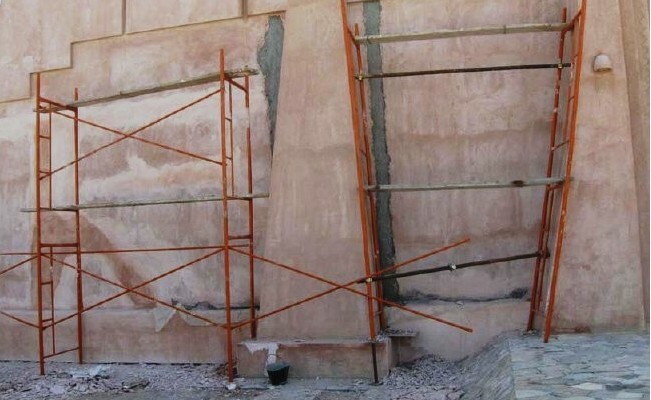 Scaffolding was erected by incompetent person. Requested the contractor to provide base plates for all components resting on the ground. Provide toe boards and guard rails and fully boarded work platform. Additional support of bracing to stabilize the scaffolding. 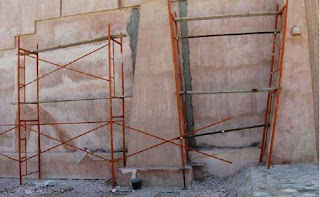 Scaffolding should be erected by competent person only. Regular inspections of the scaffold must be made and recorded. Scaffold must rest on stable surface, uprights should have base plates and timber sole plates if necessary. The public must be protected at all stages. The scaffold should have safe access and egress. Overloading of scaffolding must be avoided. Work platform should be fully boarded. Scaffolds should be properly braced and secured to the structure. "No mention of the requirement for a Safe System of Work devised from a risk assessment. As this system scaffold, the manufacturers assembly instructions would give all the relevant data for safe erection. All scaffold must meet the requirements by law. Minimum requirements are handrails, knee rails, toe boards, scaffold boarded platform tied to the structure, sufficient bracing, proper access ladders. Scaffold to follow best practices and meet local legislative requirements, competent scaffolders to be appointed for erection, alteration and dismantling of scaffolds. Method statements and risk assessments to be carried out before work begins. Ties to be installed to match best practice."